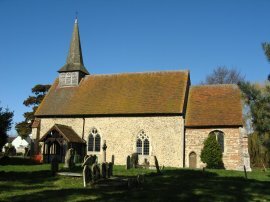 For the fifth stage of my walk along the Essex Way, which I walked on 8th March 2009, I was able to park outside the church of St Mary's at Fairstead at the point where I had finished the previous stage of the walk the week before. After having had a quick look round the church, photo 1, I set off the short distance along Fairstead Hall Road before turning right at the end of the road onto Fairstead Road. 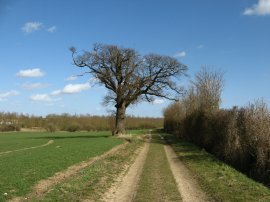 Here the route of the Essex Way soon takes a lane off to the left, Troys Chase, that runs down past the side of Troys Hall and continues on along a hedge lined track which winds its way besides fields to join a concrete farm track, marked as Pink Lane on the map, photo 2, that runs down to join Church Hill on the edge of White Notley. Here the route turns briefly to the left along the road before taking a track that runs between houses on the right to join another footpath running over fields down to a small footbridge that crosses over the River Brain, photo 3. On my older version of the OS Explorer Map 183 there is a spur of the Essex Way shown as heading off to Cressing Temple at this point however on the new version of the map, and the online maps, this is no longer marked. I did include this stretch of path on my return journey later in the day however for now I followed the main route of the path to the left running parallel with the course of the river. 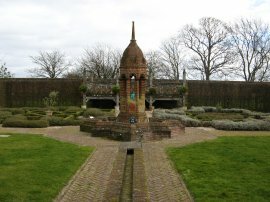 The route heads past a small sewage works down to Station Road and then continues ahead along a private road that leads towards the building of Fambridge Hall. Just past the building the route turns to the right and heads alongside a field and then passes through a large brick arch under some railway lines. The path by railway was a little muddy and I proceeded with caution as I was wearing my new boots for the first time and did not want to get them completely messy on their first outing. After considerable thought I have ended up buying another pair of the Scarpa ZG65 boots. I was not happy with the way the last pair suddenly deteriorated with the sole starting to become detached however up to that point they had been very comfortable and I knew they fitted well. I was also able to buy a pair on-line considerably cheaper than the last pair just over two years ago. Aside from the sole issue the last pair had also worn very well, the tread is hardly worn at all and the fabric upper was also still in reasonable condition (if a little muddy!). I am still considering whether I should actually see if I could get some partial refund as, although the age of the boot is probably against me, they only lasted just over 1000 miles, all along relatively lowland footpaths. ( I always wear my leather Zamberlain boots on more hilly / rocky ground not that I have been to many such areas recently). Once under the rail lines the route continues along a field side track down towards the B1018 Witham Road. Just before reaching the road the route turns to the left running along the field edge for a while before taking a gap in the hedge to the cross the road. 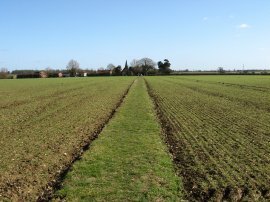 Once over the road the route joins another footpath that runs over fields, photo 4, towards Cressing Church. As I headed between the fields I was passed by a number of runners heading in the opposite direction and for the next 20 minutes or so a steady stream continued to pass by as I made my way along the Essex Way. Reaching Church Road, Cressing, where there is ample parking, the route heads across the road and down the side of All Saints Church, photo 5, before once again heading along a grassy footpath running between fields. The route skirts round the side of Egypts Farm and joins a driveway down to the rather busy Boars Tye Road where the route turns right. Whilst the Essex Way does not follow the road for long I was passed by a considerable number of cars as I made my way down to the footpath on the left that once again takes the route out into open fields. 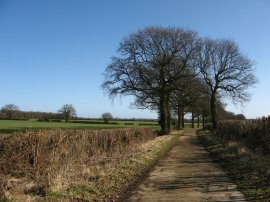 The route then winds its way between a number of open fields, photo 6, as it steadily makes its way over to a small lane. Crossing over the lane the path heads through a patch of trees and follows a route running alongside a sand and gravel pit close to Bradwell Hall. The area besides the path had been landscaped and there were only occasional glimpses of the works from the path. 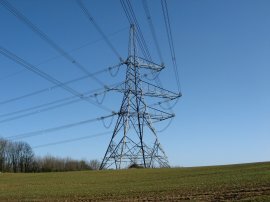 Leaving the area by the gravel pit the path passes under some tall electricity pylons, photo 7, which looked quite striking on the horizon against the bright blue sky Joining another minor road the route turns to the right, heading along to a sharp right hand bend in the road where the route then turns left heading downhill towards the river Blackwater. After a short distance the route turns to the right and runs along a field edge a few hundred yards above the river. 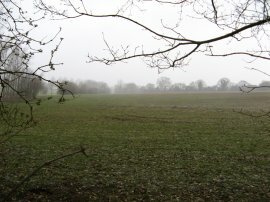 At the end of the large field the path has to squeeze down besides a wire fence running alongside another sand and gravel pit on the right and with the band of trees that line the river Blackwater on the left. 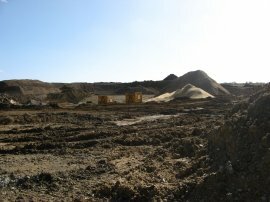 This gravel pit, photo 8, seemed now to be being used more for landfill rather than gravel extraction. Crossing the entrance to the gravel pit I joined a path that ran along the edge of a field gradually heading away from the river Blackwater up towards Curd Gall Farm where the route turns to the left to take a farm track that heads towards the village of Coggeshall. A short distance from the edge of the village I stopped by a tall tree standing besides a field, photo 9, where I finished my walk along the Essex Way for the day, having walked another 8.5 miles along the path. Although the day was bright and sunny there was a very strong wind blowing which kept the temperatures down and I used the trunk of the tree as shelter whilst I stopped to eat a sandwich before turning round to start my journey back. For once I had a reasonably interesting route back to the car at Fairstead. Setting off from my end point I back tracked up the lane for a short distance before taking a footpath that headed very gently uphill to the left across a large open field. 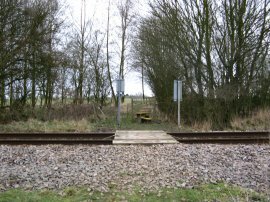 The footpath then continues ahead in a generally southern direction over another field, crossing over Cuthedge Lane and continues on besides another field to cross over a lane to join a track that leads down to a small industrial estate on the edge of what used to be Rivenhall Airfield. 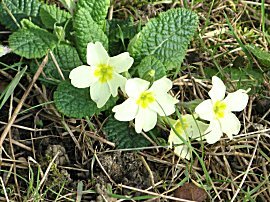 In a ditch besides one of the fields I spotted a small group of primroses, photo 10, the only occasion I saw these flowers in the wild all day. This now disused airfield had only a short lifespan during world war two, being constructed during 1943 and with active service ending early in 1946. 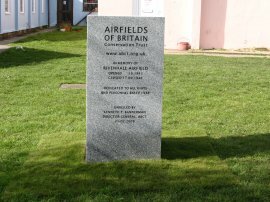 Just outside the industrial units was a small monument, photo 11, erected by the airfields of Great Britain Conservation trust dedicated to the units and personnel that had been based there which had been unveiled only two weeks earlier. Leaving the industrial units, which on my map are marked as "Polish Site" in memory of the Polish prisoners of war that were housed there after world war two rather than after any of the modern wave of immigrants, I crossed over Woodhouse Lane and continued heading South along a track that runs round the edge of another large open field besides Storey's Wood, all the time the wind blowing strongly in my face. 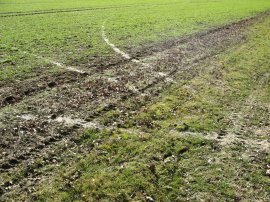 At one point there was a small gap under the mesh fence besides the field and three sets of animal tracks spread out from the hole in different directions across the field, photo 12. Leaving the edge of Storey's Wood the path heads across the middle of the field down to join a well surfaced farm track where the route turns to the left running down to join Parkgate Road. Here I turned to my right and headed down the short distance to cross over another busier road to join a driveway that runs into the grounds of Rivenhall Place. 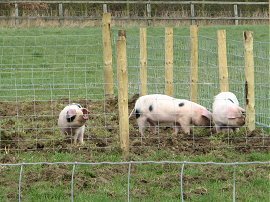 Leaving the driveway the route skirts round the edge of Park House, where in a field to the left were three your piglets, photo 13. The path then passes between two large ponds to join Western Lane where I turned to my right and headed up to Western Road in Silver End. 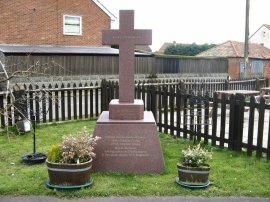 Here, in the grounds of a pub on the corner of the road was another memorial, photo 14, to the aircrews that had served at RAF Rivenhall. I then made my way through Silver End, turning left down School Lane and then right along Valentine Way to join Temple Lane where I turned to my left and headed out of the village towards Cressing Temple. I had been a bit unsure about having to walk along this stretch of road however although the pavement besides the road soon ends there was a reasonably sized, although rather bumpy, grass verge to walk on. A short distance down the road I linked up with the route of the John Ray walk which runs between Witham and Braintree and a little further on soon found myself at the entrance to Cressing Temple. 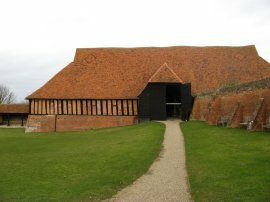 Cressing Temple, (photo's 15-20), is an ancient monument originating from the 12th century, when it was the headquarters of the first grant of land given to the religious order of the Knights Templar in England. 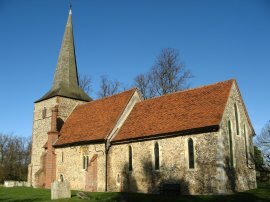 The estate was granted to the Templars in 1137 by Matilda, the wife of King Stephen. 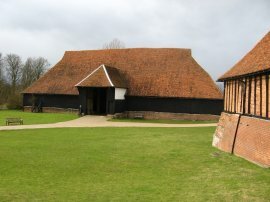 The two barns and the templar well which exist on the site, originate from this period. 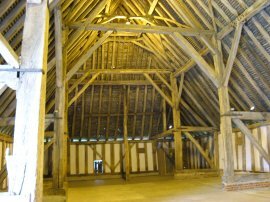 The Wheat Barn and the Barley barn are two of the finest Templar-built barns in Europe while the Barley Barn is recognised as the oldest timber-framed barn in the world. 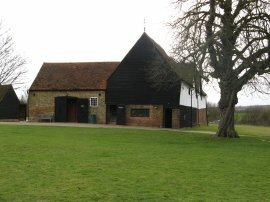 The Granary was built in 1623 and the Tudor Walled Garden also dates from this period. After my look round Cressing I then followed the old spur of the Essex Way back to where it linked up with the main route of the path by the small bridge over the River Brain shown in photo 3. The route as shown on my map goes up the driveway from the Cressing Complex to Temple Road and then turns left and left again to run along Witham Road. This road was very busy with no verge and I had to make my way very cautiously the few hundred yards down to where the footpath left the road. 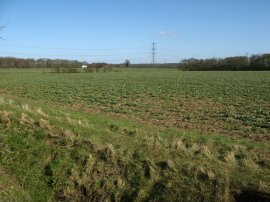 It is possible to avoid walking along the road, taking a footpath round the edge of the Cressing Temple which leads out to the road almost opposite the footpath I had now reached and is the route taken by the John Ray walk. Once off the road the path heads down over a field to cross back over the railway lines, photo 21. 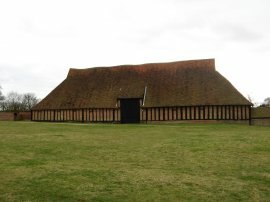 From the midway point of the walk the sky had gradually clouded over and a while I had been looking round Cressing Temple the clouds had become very grey. As I was walking down the edge of next field which led down to the River Brain the heavens opened. There was only a very thin hedge besides the field but it did provide a little shelter from the rain while I stopped and put on my waterproof coat and trousers. 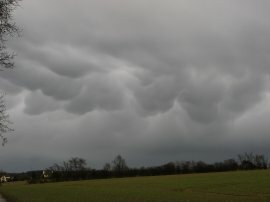 Whilst I was doing this the wind direction swung round 180 degrees and I had to swap sides of the hedge while I sheltered from the rain and hail, photo 22. 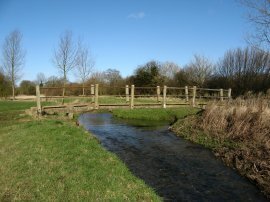 Once the worst of the storm had passed over I headed off down to cross over the river from where I followed the route of the Essex Way that I had taken in the morning back to the car at Fairstead. As I was heading back up Pink Lane the rain finally stopped and photo 23 was taken looking back at the clouds that had just passed over. 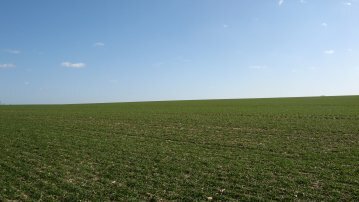 Photo 24 is a reminder of how bright and sunny it had been just a couple of hours earlier in the wide open fields near Coggeshall. Reaching the car I had walked 16.7 miles altogether. This had been the most interesting stage of the Essex Way so far and a thoroughly enjoyable day, despite the afternoon downpour.